My student reviewer today is Evan. I am posting his review exactly the way he wrote it including his planning sheet. This book reminded me of "A Dog's Life" because the two dogs were traveling far away form home to look for their mother. But in this case the two dogs were Max and Rachel and the mom was the dad. I'm not sure where the location was they were just heading straight. I definitely recommend this book. I don't know why it's realistic fiction because it is just so adventurous. The cover may not look good but you never judge a book by its cover because this book was 15 out of 10 stars!!! 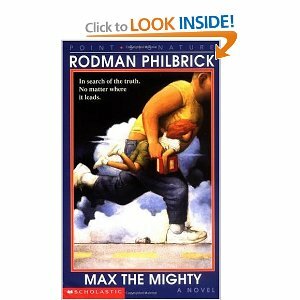 Review of "Max the Mighty"
Maxwell Kane has been a lonely kind of kid ever since his friend died. He eventually meets a girl named Rachel and they become friends. When he went over to her house one day he could hear her stepfather "The Undertaker" beating her mom. He knocked in the door and took Rachel and then ran away. Rachel told him to go to Chivalry, Montana because that's where her dad is. They hitched a ride from Dippie the Hippie and they were on their way. They ran into all types of crazy things like cops pulling them over or friends turning them in. It was all complicated for two kids. When they hitched a ride on a train that went straight to Montana they met a man named Hobo Joe. He was very friendly to them. He gave them food and blankets. Eventually his stop came and he had to leave. Then once again, RAchel and Max were on their own. When they got to Chivalry, it was a total ghost town. Not a person in sight. They saw a mining tunnel and went in. As they were in there a police officer came and the Undertaker was in it!! They both were really scared. They over heard the officer talking and he said that Rachel's dad was dead. They decided to move on and eventually, the tunnel began to collapse. This book reminded me of "A Dog's Life" because the two dogs were traveling far away from home to look for their mother. But in this case the two dogs were Max and Rachel and the mom was the dad. I'm not sure where the location was they were just heading straight. I definitely recommend this book. I don't know why it's realistic fiction because it is just so adventurous. The cover may not look good but you never judge a book by its cover because this book was 15 out of 10 stars.